Tobin, R., Bohensky, E., Curnock, M., Goldberg, J., Gooch, M., Marshall, N., Nicotra, B., Pert, P., Scherl, L., Stone-Jovicich, S. (2014) The Social and Economic Long Term Monitoring Program (SELTMP) 2013. Recreation in the Great Barrier Reef. 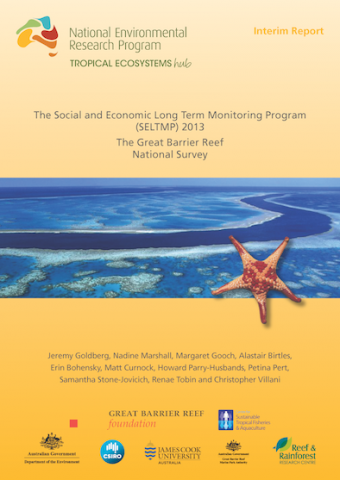 Goldberg, J., Marshall, N., Gooch, M., Birtles, A., Bohensky, E., Curnock, M., Parry-Husbands, H.,Pert, P., Stone-Jovicich, S., Tobin, R., Villani, C. (2014) The Social and Economic Long Term Monitoring Program (SELTMP) 2013. 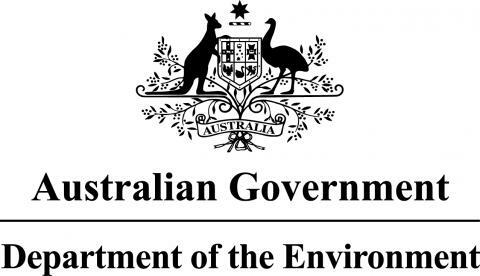 The Great Barrier Reef National Survey. 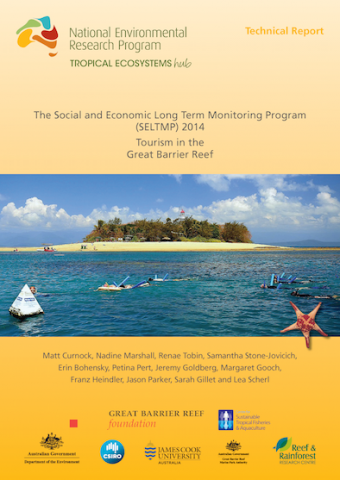 Curnock, M., Marshall, N., Tobin, R., Stone-Jovicich, S., Bohensky, E., Pert, P., Goldberg, J., Gooch, M., Gillet, S., Scherl, L. (2014) The Social and Economic Long Term Monitoring Program (SELTMP) 2013. Tourism in the Great Barrier Reef. 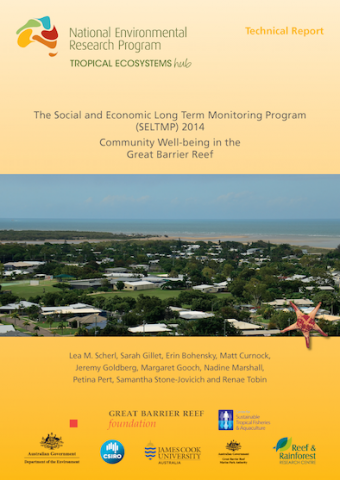 Bohensky, E., Curnock, M., Gillet, S., Goldberg, J., Gooch, M., Marshall, N., Pert, P., Tobin, R., Scherl, L., Stone-Jovicich, S. (2014) The Social and Economic Long Term Monitoring Program (SELTMP) 2014, Coastal Communities in the Great Barrier Reef. 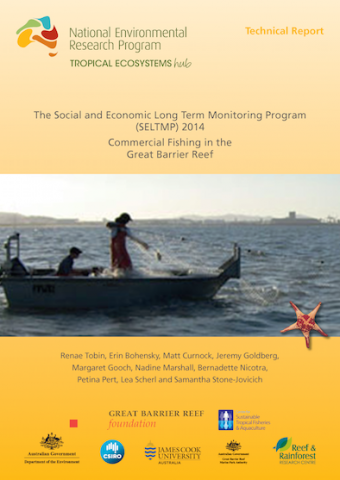 Tobin, R., Bohensky, E., Curnock, M., Goldberg, J., Gooch, M., Marshall, N., Nicotra, B., Pert, P., Scherl, L., Stone-Jovicich, S. (2014) The Social and Economic Long Term Monitoring Program (SELTMP) 2014, Commercial Fishing in the Great Barrier Reef. 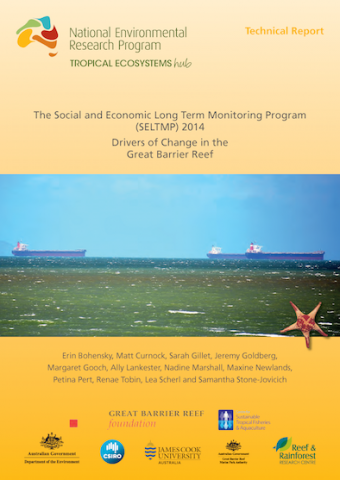 Scherl, L.M., Gillet, S., Bohensky, E., Curnock, M., Goldberg, J., Gooch, M., Marshall, N., Pert, P., Stone-Jovicich, S., Tobin, R. (2014) The Social and Economic Long Term Monitoring Program (SELTMP) 2014, Community Well-being in the Great Barrier Reef. 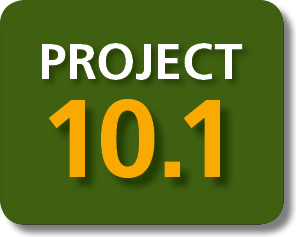 Bohensky, E., Curnock, M., Gillet, S., Goldberg, J., Gooch, M., Lankester, A., Marshall, N., Newlands, M., Pert, P., Tobin, R., Scherl, L., Stone-Jovicich, S. (2014) The Social and Economic Long Term Monitoring Program (SELTMP) 2014, Drivers of Change in the Great Barrier Reef. 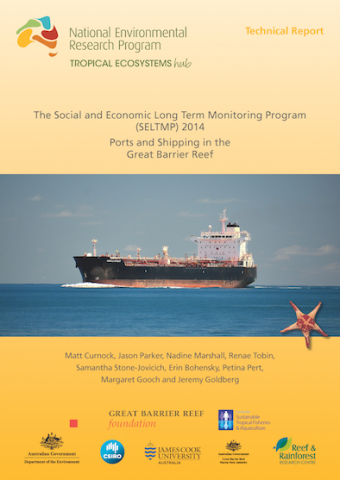 Curnock, M., Parker, J., Marshall, N., Tobin, R., Stone-Jovicich, S., Bohensky, E., Pert, P., Gooch, M., Goldberg, J.. (2014) The Social and Economic Long Term Monitoring Program (SELTMP) 2014, Ports and Shipping in the Great Barrier Reef. 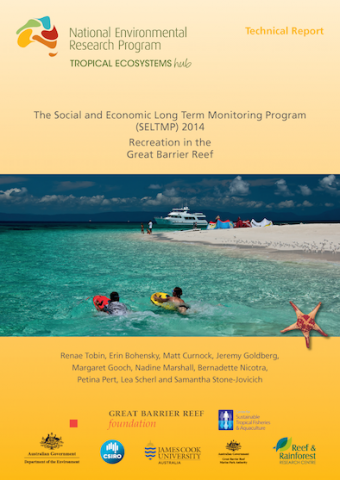 Tobin, R., Bohensky, E., Curnock, M., Goldberg, J., Gooch, M., Marshall, N., Nicotra, B., Pert, P., Scherl, L., Stone-Jovicich, S. (2014) The Social and Economic Long Term Monitoring Program (SELTMP) 2014, Recreation in the Great Barrier Reef. 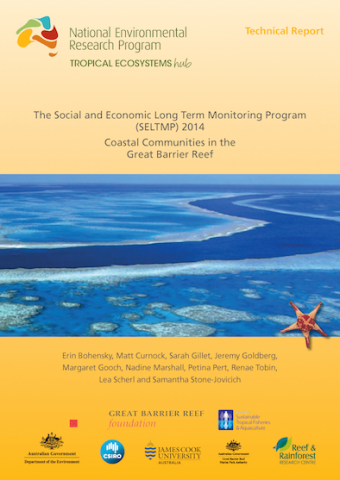 Curnock, M., Marshall, N., Tobin, R., Stone-Jovicich, S., Bohensky, E., Pert, P., Goldberg, J., Gooch, M., Heindler, F., Parker, J., Gillet, S., Scherl, L. (2014) The Social and Economic Long Term Monitoring Program (SELTMP) 2014, Tourism in the Great Barrier Reef.